This post provides a review of the injury and fatality statistics and their impact for the period 1 April 2014 to 31 March 2015 and the trend analyses drilling down to the sectors and how the UK compares to the rest of Europe. The Health and Safety Executive (HSE) published the latest UK Health and Safety statistics on 27th October 2015 which includes occupational health and accident statistics. Click for the full Health and Safety Statistics 2014/15 report. Are the accident numbers increasing or decreasing? What do these figures show in relation to the numbers of people employed in the UK? Which types of employment have the most number of fatal injuries? How does the UK compare with the rest of Europe? Let’s take a look at what the figures show in relation to these questions. The statistics clearly show that provisionally there were 142 people killed at work in the UK in 2014/15 (the figures published in October each year are always quoted as provisional due to the fact that under RIDDOR a fatal accident includes a death up to one year from the date of the incident). These statistics do not include people killed whilst travelling on the roads who were at work at the time, these are recorded in the road traffic statistics. When the fatal accident number (142) is compared against previous years, it appears that it does not follow a similar trend. In 2012/13 and 2013/14 150 and 136 fatalities were reported respectively, as the graph in figure 2 below shows. The overall trend since 1995/96 however can clearly be said to be in the right direction - downwards (although less clear since 2008/09), with the most noticeable reduction occurring in fatalities to employees. Similar comparisons of major and lost time accidents under RIDDOR are a little more difficult due to the fact that changes to RIDDOR have resulted in the term “Major Injury” now being “Specified Non-Fatal Injury” (and a slight change in the list of these) and “Over 3 Day Injuries” being replaced with “Over 7 Day Injuries”. However, a summary look at these figures also suggests a downward trend (see figure 3 below). As can be seen in the figures previously, it is common that accident figures are not only quoted in pure numbers but are also expressed as a rate per 100,000 workers. 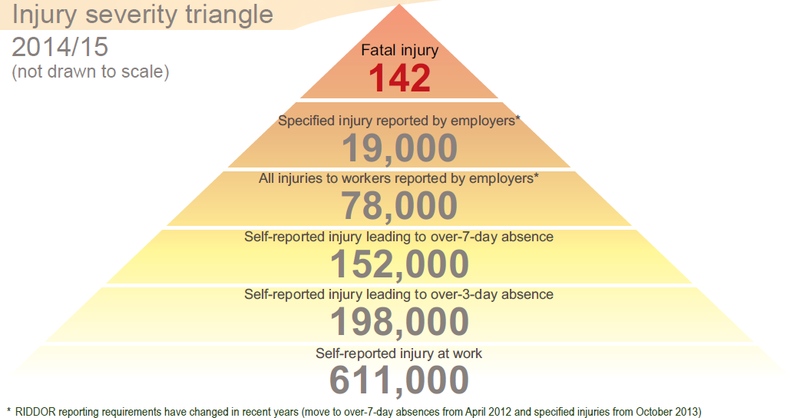 This gives an indication of how many workers in 100,000 are likely to experience such an injury. The provisional fatality figures for 2014/15 give a fatality rate of 0.42 per 100,000. Or in other words 0.42 workers out of 100,000 were killed last year – about 1 worker in every 238,000. 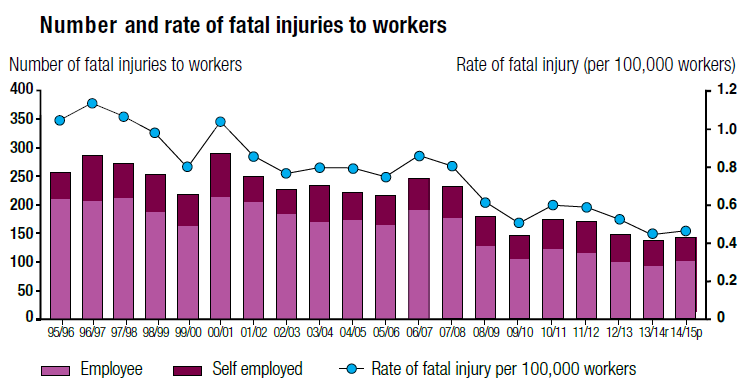 With current employment levels in the UK at around 30.8 million people, fatalities equated to approx. 0.0005% of the working population. Based on pure statistics this seems very low but never forget that this means 142 people were killed because of what they did for a living – 142 people did not return home to friends, family and loved ones. Further details can be seen in table 1 below. However, when examining fatality rates per 100,000 workers in each sector, the headlines are different with Agriculture and Waste and Recycling being the highest with rates of 9.12 and 4.31 respectively – table 2 below. The UK consistently has one of the lowest rates of fatal injury across the EU. In 2012 the standardised rate was 0.58 per 100,000 workers, which compares favourably with other large economies such as France (2.64 per 100,000 workers), Germany (0.9 per 100,000 workers), Italy (1.29 per 100,000 workers) and Spain (1.99 per 100,000 workers) (Eurostat, ESAW, 2012). Figure 4 below shows the UK fatality rate against other EU countries. The UK’s safety performance has shown a very slight rise in the number of fatal accidents in 2014/15 with 142 fatalities, compared with 150 and 136 fatalities in 2012/13 and 2013/14 respectively, the employment sectors with the highest fatality numbers being Services, Construction and Agriculture. The UK also has one of the lowest fatality rates in the EU. Whilst 142 fatal accidents is a good achievement, equating to around 0.0005% of the working population, there should clearly be no room for complacency. That’s 142 people too many – 142 people last year did not return home to friends, family and loved ones. I’m sure everyone would agree of the importance of continually striving towards the ultimate goal of zero. 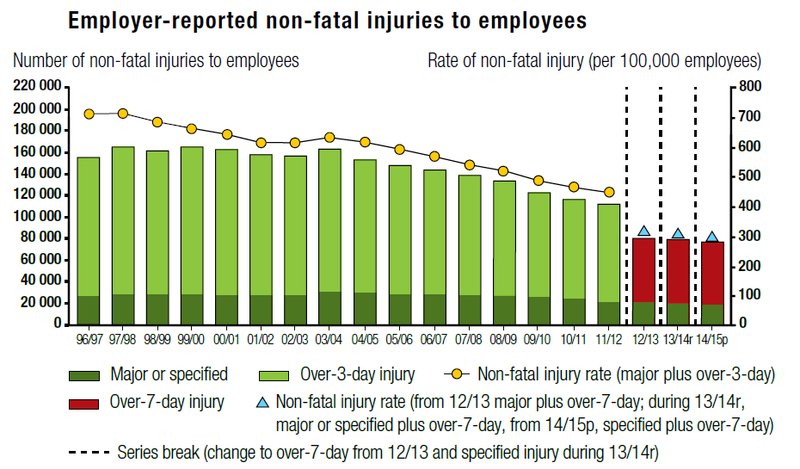 HSE Statistics on fatal injuries in the workplace in Great Britain 2015.